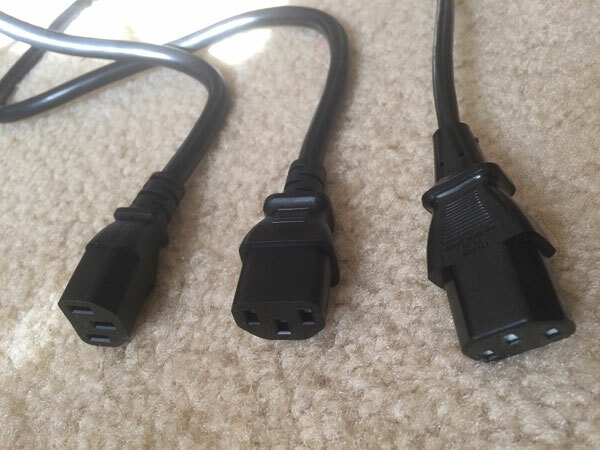 Here are three power cables. Do you see what's different between them? Hint: One of them is a serious fire hazard. I don't know about you, but I have a box full of computer cables that I amassed over the years, and whenever I need a cable, I grab one from the box. There are plenty of power cables in that box, and I never thought twice about which one to use for a PC. Until one episode about two years back. The PC that I was using was a real high end killer machine - I don't remember the exact specs, but I know that it was a $1000 Intel CPU, so I believe it was a Core i7 Extreme, paired with a high end Geforce card (I believe a GTX 660 or 680). I was playing a game, when suddenly I heard a popping noise and saw sparks falling to the ground. Like, literally sparks. At first I thought that the power supply blew up and tried a new one. After some more trial and error, we finally found out that is was the power cable that melted and sparked. I had never seen that happen before. I knew that the super high end power supplies had a different connector (IEC 60320 C19 instead of C13) - but I didn't think that there was any difference for regular power supplies. Turns out that the thickness of the wires inside the cable matters a lot. This makes sense: Electricity going through a wire heats the wire up - the more power, the warmer it gets. If the wire isn't thick enough, it will literally melt and can then cause a short, or like in my case, sparks (and potentially a fire). One of the standards used for wire thickness is called the American wire gauge, or AWG for short - you may have seen this used for speaker wire. 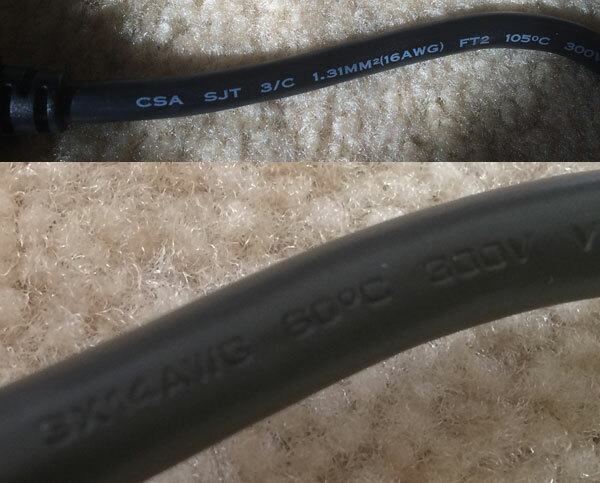 A cable that you buy will have a number - like 18 AWG - which describes the thickness. Lower numbers are thicker, so a 14 AWG wire is thicker than an 18 AWG wire (do note that there is a difference between a wire and a cable - a cable is one or more wires plus insulation and connectors). In the above picture, there are 14, 16 and 18 AWG cables with C13 connectors shown. Monitors tend to ship with 18 AWG cables, which is why I have a bunch of them. But 18 AWG power cables are not suitable for powerful PCs. They might be suitable for lower end PCs (that can safely run on a 450W or less power supply), but even a single 95W CPU and 8-Pin powered Graphics Card (like a GTX 1080) might draw too much power for the cable - a fire hazard waiting to happen. The cables will have their gauge written on them, or etched (which is harder to read). Now, before you go and buy a bunch of 14 AWG power cables, do note that the thicker a wire is, the stiffer it is. 14 AWG cables are generally very stiff, so if the PC is close to a wall or the cable needs to make a bend for another reason, you might be putting a lot of force on the power supply connector. In general, 16 AWG should be perfectly fine to at least 850W - possibly more. I'm on Stack Overflow, @mstum on Twitter and mstum on GitHub. Unless explicitly stated otherwise, any code posted on the blog is licensed under The MIT License.